First of all, i want to apologize for my long hibernation from this blog. Well, a lot of things have happened, and changed in the past few years. I am no longer a university student. I have finished my degree and graduated on February 2011. And after that, I directly took a job. It didn't last long, I worked for the company for a few months then I decide to resign from the job. Long story short, I have been wandering around and struggling with everything until this year, I am slowly, but steadily getting back on my feet again. I never forget how much I love the miniature world. I followed some updates from miniatures pages on facebook, and wondering when will I be back? I feel like I never have time to make minis, or explore what I could create in mini scale. Last month, I went to Bali and meet my friend, she is the owner of MNO.logie accessories line. She made a very beautiful transparent clutch bag (you can find it on Etsy). She gave me encouragement to pursue my dream, and she told me that I have to do something with what I am passionate about as soon as possible, before I get too old. She also told me this ; "when you look back on your life, you'll regret the things you didn't do more than the ones you did." So, I make this post, my very first post after a long time absent, as a come back greeting. I will blog again, and for sure I will make minis again. 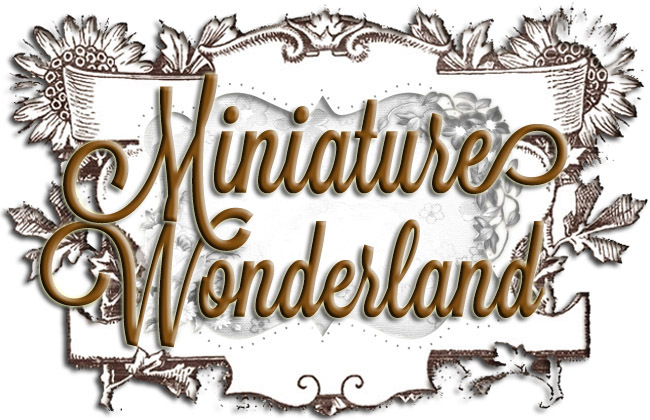 This is the new beginning of Miniature Wonderland. I will probably make some changes in this blog, and I'm also thinking about selling my work online. There are so many things to do! I will write my real post after I get back from Europe (yes, I'm going to Europe next week *so exciting*).